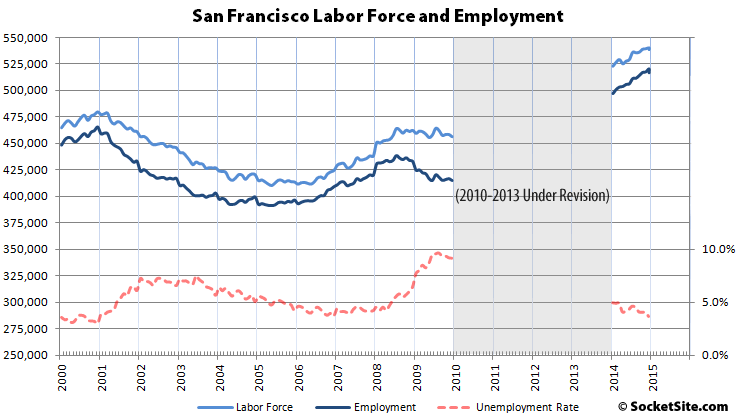 Following a once-a-year benchmarking, a revision to the data which incorporates additional inputs and refined estimation techniques, the unemployment rate in San Francisco is back above 4 percent. But the estimated number of people living in San Francisco who have a job now measures 516,700. That’s 33,900 higher than previously thought. On an adjusted basis, the number of employed residents of San Francisco actually slipped by 3,800 from December to January, but the count remains 19,600 higher versus the same time last year. Compared to the end of 2009, the number of employed residents in San Francisco has increased by 101,800, a 25 percent jump in just five years. 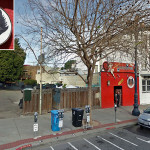 And compared to the height of the dot-com peak in December 2000, at which point the unemployment rate in San Francisco measured 3 percent with a labor force of 480,000 (versus an adjusted 538,700 today), there are 51,000 more residents of San Francisco with paychecks than there were before. On a benchmarked basis, the unemployment rates in Marin and San Mateo both ticked up as well, to 4.0 percent and 3.9 percent respectively, and the unadjusted unemployment rate for California jumped from 6.7 to 7.3 percent. 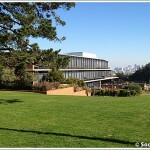 Tech Space On Former Cemetery And UCSF Campus Site? All excellent news. Now could we please build more housing for these new residents? Build more for the high end and the prices at the low end should drop. And developers should build at the high end, that’s where the money is. And they are greedy, but it’s only the rich that have to pay the price for new expensive development. Build a few more houses for Mitt Romney and John McCain and the price of hovels will drop. The more Lamborghinis on the streets, the lower the price of a used chevy. Supply the greatest demanders until they can’t remember how many houses they own and surely there will be no more homeless, for they will dwell in the shadows of the houses of the lords. Have you considered writing poetry? consistent with the increase in labor force participation noted elsewhere. good news, all told. As a struggling, unpublished poet/ unappreciated artist/ unrecognized political science genius, who prefers to spend my time reading, which makes me so much smarter and more special than everyone else, all of these evil, greedy “working” people are making me feel bad, because they might cause my evil, greedy landlord to kick me out of my $259/month sweet rental in North Beach (which my parents pay the rent for, even though I’m 48 years old – how dare these “working” people put all this stress on my parents, who might have to spend MORE on me if I get kicked out?). This is horrible! SF will be a wasteland if I am forced to move away! You “working” people have no idea how much damage you’re doing to this city. You NEED my special genius. You NEED me, and those like me, or you’ll never come to understand that Rent is Theft, and Private Property is Immoral. STOP WORKING!! JOIN THE REVOLUTION!! Come join your comrades at the SF Tenants’ Union, where together we can create a Utopia where everyone will get cheap housing – with killer SF views!!!! Or just quit your job and leave my city. Y’all are bumming me out. Punching down is not funny. What’s it like being in touch with Real Soul, unlike us working zombies who are whitening and borifying San Francisco and thereby destroying its soul? anyone have the stats on how mean and median salaries have risen during this time? It seems like it should be a lot with many of the new jobs coming from high paying tech. I’ve worked my tail off all my life, saved, saved, saved, and have made many sacrifices so I could afford to buy a home. I didn’t expect to be able to afford a home in San Francisco. I just wanted to own A HOME. But everything just fell into place at the right time, and now I do own here in the city. What IS it about people and their feelings of entitlement to live in SF? If you can’t afford to live here, DON’T. That’s what the suburbs are for. But don’t demand and expect to be able to live here at the expense of the “rich” and “greedy.” If you want to live/own here, work hard for it–just like everyone else who lives/owns here. You have no idea how sad and pathetic you sound when you blame your life(style) on those who have what you don’t have but want. I have an amazing place in the city. And it only took me 14 years from the time I left engineering graduate school to owning my own place. My college experience was 99% studying for 6 years before that. But what really gets me is that the people complaining about how expensive it is to live here also don’t want it to change. They want incompatible things. Maybe if these “activists” had taken more rigorous classes in college, they’d have a clue how things work. Strangely, I do have a soft spot for struggling immigrants. It doesn’t matter how hard I work, I will never know what it’s like to work 14 hours a day in a degrading job for just a few dollars. If anyone deserves subsidies from people like me, it’s these people, who seem to ask for nothing. i bought 3 yrs ago, so it took me 16 yrs of living here and sacrificing and saving. I was more than $35K in debt from undergrad and attended grad school here adding another $45K in debt. Too many people wont sacrifice going out at night to save. I also have a lot of compassion for struggling immigrants, as well as those US citizens born into situations such as not ahving a father, or in areas of extreme poverty and bad public schools. I full support housing for true BMR, those making <60% of the median, but I cannot go for subsidizing the middle class people making between 60K-145K. they can afford the surrounding areas. BMR is not subsidized by taxpayers. It is subsidized by developers thus the buyers of the newly built condos. Of course, higher price of new condos will make existing housing more expensive as well. So all new homebuyers are subsidizing the BMRs. In SF, the only people who are extremely mistreated is the landlord. Rent control is fully subsidized by landlords. Of course, rent control will the market rent higher as well. So most new tenants indirectly subsidize the rent controlled tenants. It is minority tenants subsidize the majority of the tenants. SF is crushing the “minority” people such as landlords, newcomers including new renters and new owners. The buyers are not paying any more – the developers are selling market-rate units for the highest price they can possibly get in the market. They do not, and cannot, charge more because they also built some BMR units (if they could, they would just charge THAT higher price regardless). Now there is perhaps some diffuse and incalculable “impact” from having fewer market rate units in the first place. But it is the developers subsidizing BMR units, not buyers. I’m not defending them (I think BMRs are a ridiculous idea) but those are the economic facts. Your landlord/rent control points are spot on. It took me 11 years from the time I started my career until I was able to purchase the home I live in now, although this is my second but primary home. I work nights, weekends and holidays. I’ve pulled more all-nighters working now than I did when I was in college. When I want something, I don’t ask for it. I just WORK for it. I work really, really hard–every day. I expect and want everyone else to do the same–or at least TRY.